Hands up if you’ve had that daydream? The one where you’ve been bored at work and your mind drifts to a sun-drenched paradise; there’s palm trees, crystalline waves crashing on a white-sand beach, bottomless piña coladas and an overwater bungalow. And it is always an all-inclusive overwater bungalow, because that’s the best part of tropical getaway, right? Well, it’s time to make that fantasy a reality. The South Pacific is teeming with Instagram-worthy islands that will have you feeling like an A-list celebrity in no time. We’ve narrowed the field down to a few islands that are renowned for their super-luxe overwater bungalows. It was a tough job, but someone had to do it. If you thought a Bora Bora getaway was out of reach, think again. Once an adults-only playground for the rich and famous (Nicole Kidman and Jennifer Aniston are fans), the remote shores of this pristine French Polynesian island are more accessible than you’d expect. Flights from New Zealand to Tahiti depart frequently, and from there you’ve got your pick of the high-end resorts. After your own deserted island with boat-only access? The Sofitel’s secluded overwater villa is for you. What about epic views of Bora Bora’s rainforest-covered mountains? The Conrad’s bungalow has you covered. And if money is no issue then there’s no going past St Regis. Plunge pools, in-suite spa treatments, total privacy and water so blindingly blue it doesn’t look real – you name it, the St Regis has it. Consider it the closest thing to heaven on earth. It’s time to start practicing your best ‘bula!’, because the island mecca of Fiji is one of the best South Pacific destinations to indulge in the luxury of an overwater bungalow. Only three Fiji resorts offer this exclusive form of accommodation: Koro Sun Resort, Fiji Marriott Resort Momi Bay and Likuliku Lagoon Resort, making it even more of a highly sought-after experience. While traditional Fijian overwater villas (known locally as ‘bures’) were made of nothing more than straw and wood, the bungalows of modern Fiji lack nothing in the way of first-class amenities. Expect private decks, swim-up cocktail bars, glass panel flooring and bath-warm water lapping at your doorstep. Spend a night in one of Fiji’s floating villas and we guarantee you’ll never want to step foot on dry land again. As the original birthplace of the overwater bungalow – the very first one was built on the island of Raiatea in 1967 by three US expats – there’s really no better place to treat yourself to one of these iconic villas than in Tahiti, French Polynesia. 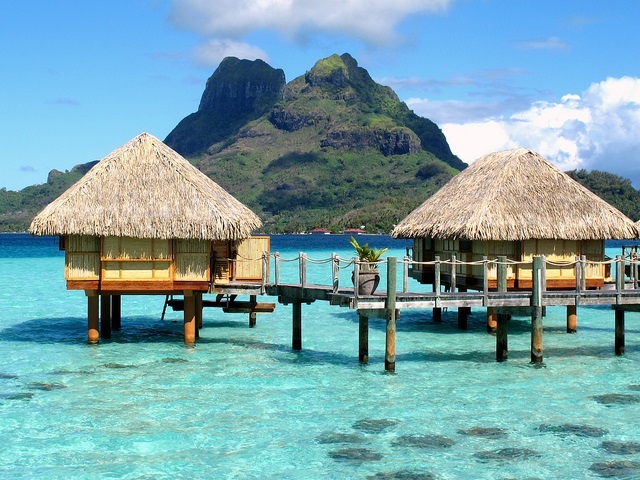 While the first overwater bungalow was nothing more than a wooden shack on stilts, today’s modern Tahitian bungalows are considered some of the best in the world. 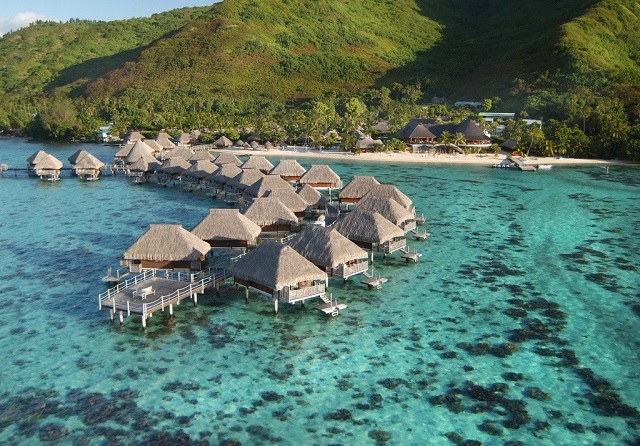 Crystal clear lagoons and lush, rugged coastlines have created the perfect backdrop for Tahiti’s overwater villas to shine, so if you can see yourself watching pastel-coloured sunsets from the comfort of your very own hammock (cocktail in hand, of course), or having your breakfast delivered by canoe every morning, then a Tahiti holiday is calling your name. With a reputation as one of the friendliest isles in the South Pacific, and stunning scenery you could easily mistake as some kind of tropical mirage, there’s no denying the allure of Vanuatu. 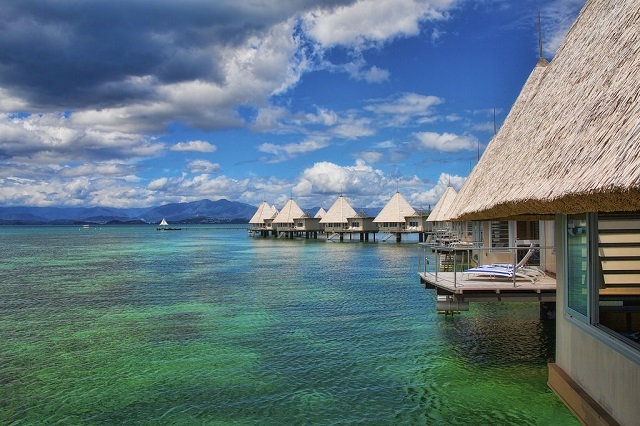 But the real appeal of Vanuatu as an overwater bungalow destination lies in its affordability and kid-friendly status. With the majority of the overwater bungalows aimed squarely at honeymooners, it’s refreshing to discover you can find villas fit for the whole family for around $200 a night. Don’t think that means you’ll be getting a second-rate bungalow either, at Vanuatu’s two overwater resorts – the Holiday Inn and Warwick Le Lagon – you can still look forward to all-inclusive packages, plenty of water activities and luxury finishes. For many, the only way to visit New Caledonia is via cruise ship, aboard a hop-on, hop-off trip that offers nothing more than a mere glimpse of this South Pacific gem. However, with New Cal now home to its very first overwater bungalow resort, it’s time to ditch the crowded cruiser and make your next visit a longer, more extravagant one. Located just 20 minutes from Noumea, L’Escapade Island Resort is a thatched-roof haven situated in the middle of a natural marine reserve, with bungalows designed specifically to mirror the curve of the shoreline. All the classic overwater villa facilities are included – from the Italian marble bathroom to the sunset-facing terrace, but if you needed further convincing, flights to New Caledonia take just three hours, making it one of the closest South Pacific islands to New Zealand. What more could you want? !